Have your hopes been dashed into pieces when you tried to make a relationship work and the other person didn’t respond as you wished? Have you asked someone to forgive you, but he or she didn’t respond as you desired? Have you prayed for healing in a relationship, but your prayers haven’t been answered? I understand these overwhelming disappointments all too well, as one of the most important relationships in my life was lost. 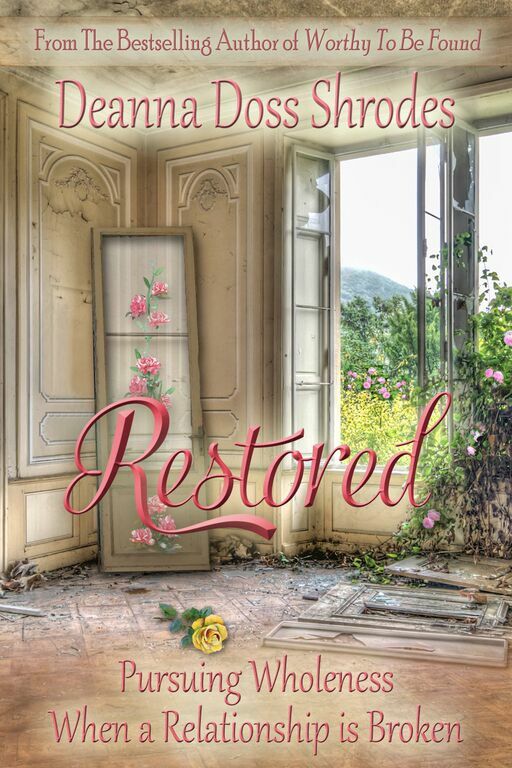 Restored brings a message of hope to everyone that you can be restored, even when a relationship isn’t. YOU can be restored, even if the other person doesn’t respond as you wished. YOU can be restored, even if your spouse leaves you. YOU can be restored, even if your parent rejects you. YOU can be restored, even if a friend betrays you. YOU can be restored, even if you lose the job you love. YOU can be restored no matter what! And it doesn’t always involve the cooperation of another. Restored brings forward the important truth that no matter what another person chooses to do, we as individuals can be restored, if we put ourselves in position to be. Restored isn’t merely my experience of restoration, but rather a spiritual template and a purposeful guide designed to help readers journey through their own restoration process. Within the pages of this uplifting and insightful story, you will find healing if you will pursue it with your whole heart. Available on Amazon Kindle and Paperback, November 2.